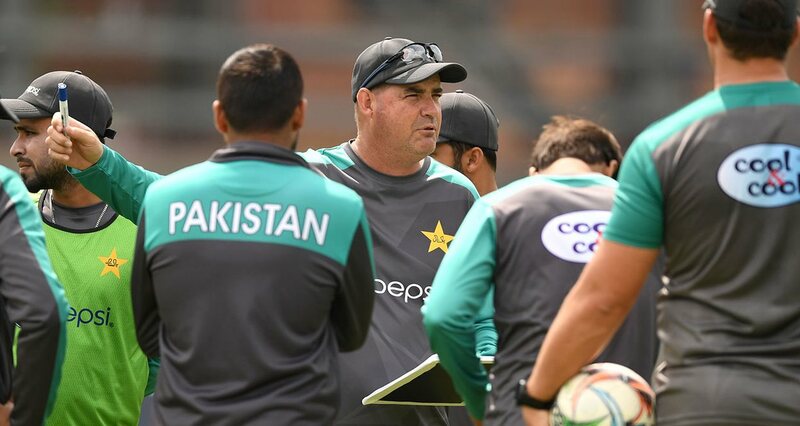 Acknowledged by many as possibly the most effective Head Coach in Pakistan cricket's history, Mickey Arthur continues to guide his side towards successful results as the recent Test tour of Ireland and England and the T20I series victory against Scotland indicated. In an interview, Mickey Arthur spoke about his disappointment of not winning the Test series against England, the energy players like Shadab Khan and Hasan Ali bring to his side, his belief in the abilities of Azhar Ali and Asad Shafiq, Mohammad Amir's fitness concerns, Sarfaraz Ahmed's performance as captain and his determination, if allowed, to continue to take Pakistan to new highs as Head Coach beyond the 2019 World Cup. PakPassion.net: After the Leed’s debacle, you had said you would dish out some ‘hidings’ – did you do that? Mickey Arthur: After the Leeds defeat I had spoken about ‘dishing out a hiding’ but that would have been taking it to the extreme, although what we did have were some discussions and debates regarding the second Test. I guess the point is that we are a young team, so inconsistency levels will be there as we forge our way forward. But, still for me and the team, we were absolutely gutted as this was an opportunity for us to win a series. One of the things we want to do is to be ruthless which we weren’t when going into the last Test match and that really disappointed me. Saying that, the whole tour and the training beforehand had been exceptional, and I can’t fault the effort and the dedication of the players as they were unbelievable. PakPassion.net: Despite several positives on the recent tour, you must be furious about that Leeds performance? Mickey Arthur: People say that overall it was a good result and it yes was a good result for sure and if someone had said that coming on this tour we would win 2 out of 3 Test matches, we would have taken that gladly. But, we want more. We want more as a team and as a group together as I think winning away from home is so tough and we had a real opportunity to do that against England. But, I am not going to harp on about the negatives as there were so many positives from this group of players as they are a phenomenal bunch. However, we shouldn’t have to accept a 1-1 result as we always want to win series. PakPassion.net: Would you like to elaborate on what the likes of Shadab Khan, Hasan Ali and Faheem Ashraf bring to the team? Mickey Arthur: First and foremost, myself, Inzamam-ul-Haq and the selection panel are looking at a brand of cricket we want to play. We are very keen on going into Test matches with 5 bowlers as we feel that is the way forward. But, in order to do that we have to find ourselves an all-rounder. So, we have got ourselves a very good spinning all-rounder in Shadab Khan who came in for Yasir Shah and did a really good job. On top of that, Faheem Ashraf gives us that seam-bowling all-rounder option too. Now if we play in the UAE, we can always use a spinning all-rounder but for us to be successful in England, New Zealand, Australia and South Africa we have to have a seam-bowling all-rounder. So, it was important that we could identify a player who could fill that role. We’ve then invested in our five batsmen with Sarfaraz Ahmed as the number 6 batsman to get us the runs. Our 7 and 8 position batsmen then become the extra set batsmen and they have shown through the recent Test matches that how valuable they have been and how valuable they have become for us in terms of getting important runs. Plus, we have put work into the tail to score runs as well. As you can see, our tail has done a pretty good job in scoring runs as well. We always set the top-order batsmen to get 300 runs or more. Our first six-wickets are responsible for 250-300 runs and the rest of the batsmen are supposed to get another 100 runs or so. By and large, our tail has delivered as well. Our current thought is that we have a squad that has so many options and the players that have come in have brought in a real fresh and new energy. There is no fear of failure but there is a very good balance between confidence and arrogance. They are not arrogant but believe in their own abilities. But above all, it’s a dressing room that believes in each other. It’s a dressing room that fights for each other. It’s a dressing room of genuine friends who have bonded together so well and are being led by a good captain who they definitely see as the leader of the pack. It’s just got such a nice feel about it and there is a lot that we can work with going forward. And any player who comes into this environment will work within those parameters. As I have said before, the dressing room vibe and atmosphere and closeness is almost the best I have ever seen in my years of coaching which is a really good thing. With those positive vibes, you can take a team forward because everybody is in it together. PakPassion.net: There seem to be question marks about whether Azhar Ali and Asad Shafiq have the temperament to take on the mantle left by Misbah-ul-Haq and Younis Khan. Is that a concern? Mickey Arthur: This is not a concern for me at all. I genuinely believe that both Azhar and Asad have the temperament, technique and the drive and desire to be very successful for us. I am not concerned because I know of the ability they have and the ability to deliver for us in the end without a doubt. PakPassion.net: Do the critics have a point when they say that finding middle-order replacements for Younis and Misbah was left a little too late? Mickey Arthur: Let me start by saying that you don’t replace players like Younis and Misbah like that. They were quality players. To lose two players like that together was tough on the team and our batting. You can never replace Younis and Misbah in terms of what they brought to the team. But, when you've got Azhar Ali and Asad Shafiq and the likes of Babar Azam and Haris Sohail who I rate highly as he showed some good skills, as well as some other batsmen in the wings then we need to give them the best opportunity to perform and take over that mantle. Let me reiterate that I have never had any concerns about Azhar and Asad as I have seen them perform under pressure and in all conditions. PakPassion.net: Mohammad Amir has been carrying a few injury niggles, what are the plans regarding him playing in all three formats in future? Mickey Arthur: I am going to sit with Mohammad Amir and Inzamam-ul-Haq soon and we are going to map out a future for him. We need all our bowlers firing when it's time for the 2019 World Cup so that we are in a position to choose the best possible squad we can have for that tournament. We also want to make sure that those players are not tired and are ready to deliver their best performances over that period for us. This is a discussion Inzamam and I will have between ourselves and then we will discuss this topic with the players too. After our discussions, Inzamam will present the plan to the selection panel and then to the players. Between all of us, we will have something concrete to work with, in what will be a very busy period leading up to the 2019 World Cup. PakPassion.net: On that point, 4 out of the 5 bowlers who played in the recent Test series are playing all three formats; Is that a concern? Mickey Arthur: The answer to that is yes and no. I guess it depends on how we manage these bowlers. The positive from all this is that we already manage them each day. We know where these bowlers are in terms of their fitness status and how fatigued they are, and when they need a rest. They are under our control and that’s a real positive as we see them all the time. There are some very good replacements coming in as we see in our Twenty20 squad such as Rahat Ali, Shaheen Shah Afridi, Usman Khan Shinwari who has already performed above what was expected of him. We also have Rumman Raees who is coming off some injuries and nearing full fitness now and also Wahab Riaz who is working very hard at the NCA. So, we have a very good pool of quick bowlers now. It's just going to be up to us to see how we manage them so that when we get to that World Cup, we can select players from a fully fit quartet of bowlers and know that they will be fit and ready to go when we do pick them. PakPassion.net: Where do you see Ahmed Shehzad’s future as some critics say he is being picked without too much in terms of form to justify that selection? Mickey Arthur: I am going to stick my neck out a bit for Ahmed Shehzad and say that he was unlucky to lose his place in the T20I team. That is because his performances against the World XI were excellent. His one performance against New Zealand was impressive and he didn’t do too bad against Sri Lanka either. He only missed out from a place in the Karachi games against the Windies because we made the decision to move Babar Azam to open which allowed us to play Hasan Ali, Hussain Talat and Asif Ali in the team. Shehzad missed out in the team because Fakhar Zaman will always play in T20Is as he provides something different to our team. He is always the first choice when you are picking an opening batsman for white-ball cricket. Ahmed Shehzad is at an interesting point in his career as he knows that only good performances will justify his selection. I am still backing him as I still feel he has a role to play in T20Is and perhaps in ODI cricket down the line, but the rest will be up to him. PakPassion.net: How is Sarfaraz Ahmed coping with leading the team in all 3 formats of the game? Mickey Arthur: I feel that Sarfaraz is coping really well. He hasn’t got the amount of runs that he would have liked to have accumulated and he knows that. But, he will bounce back certainly in Test cricket. I feel that his captaincy is getting better and better tactically on the field. And we need to be mindful that this is a very tough job to captain in all formats of the game, keeping wickets as well as batting in the top 6 in games as well. That is a hell of a tough job for anyone. I have been fortunate to work with a lot of very good captains in my time but the way Sarfaraz leads these boys and the respect he has in the dressing room, and the way the boys respond to him, his balance of firmness on the field and friendship off the field is as good as I have ever seen. People never see that but Sarfaraz carries that balance on and off the field so very well. We just need to give him some breathing space here. He is also working exceptionally hard on his fitness and he never shirks from any training. I have no doubts that he is the right man to lead the team and that he will get runs sooner rather than later. PakPassion.net: Where do you see Fawad Alam in terms of international chances? Mickey Arthur: That’s a tough one. I guess the answer right now is that I am not sure. What I will say is that the doors are not closed on any player. But if we look at the way we are going with our Test line-up, if we have Azhar Ali and Imam-ul-Haq at the top, then Haris, Asad and Babar and we are only going for 5 batsmen then it's tough for anyone to get into that side. On top of that, the pressure on incumbents is big as well to maintain their position. What we are trying to do is to create a ‘depth chart’ so we know who the best players are for each position and who is the next deserving player for that same position which is something Inzamam and I will always discuss so we know where we are at. I will also say again that the door isn’t closed for anyone; everybody has an equal opportunity to play for Pakistan and we are very open-minded with that. PakPassion.net: How would you rate yourself out of 10 for the job you have done as Pakistan Head Coach so far? Mickey Arthur: That’s a tough question and I won’t give a definitive answer to that but let the people decide that. What I will say is that this is a job I am very passionate about and one that I absolutely love. We have certainly changed the direction of thinking and put a lot of emphasis on areas that we need to improve upon. One day when I am not Pakistan coach any more, I would like people to say that we had a foreign coach and a coaching team that came with him and they have left a legacy for Pakistan cricket. They weren’t here just to get their salary cheque at the end of every month and these guys have actually left a legacy behind which is totally what I would want to do. It’s a job I am incredibly passionate about and as long as I am making a difference to the Pakistan cricket team, I would like to be involved with them. I would love to stay as long as I possibly can. PakPassion.net: With your contract as Pakistan Head Coach up for renewal at the end of World Cup 2019, is there a temptation to move on and do something different? Mickey Arthur: I have done a lot and I have been very fortunate in my career to have worked all over the world and have been an international coach for a long time. It’s very demanding, it's challenging and it's all-consuming. But, I would certainly not change it for the world and this Pakistan job stimulates me all day because I feel there is still so much to do. I would like to be involved here until I have finished what I set about to do with the Pakistan team. PakPassion.net: So, if the PCB asked you to sign-up for another 2 years after next year’s World Cup, would you be happy to do that? Mickey Arthur: I would like to do that with pleasure. PakPassion.net: What’s the best and worst part of being Pakistan’s Head Coach? Mickey Arthur: The best part of this job is being involved in a country where cricket is so passionate and so followed. I love every minute of it but most of all, I love the skill levels of the players. Coaching a sub-continental team for a western coach is a challenge because you are out of your comfort zone as everything is the other way around in terms of batting and bowling, and fielding. In South Africa and Australia, pace is predominant, and the guys generally play pace really well. However, in the sub-continent the nature of cricket is generally spin predominant. But, the really best part of coaching in this part of the world is the stimulating nature of knowing that we bring joy to people every day with us winning. So, I see that as a major responsibility and that is something that drives me. After we won the Champions Trophy, we saw the smiles on the people’s faces and the welcome that the guys got. This made me incredibly happy and proud because it stimulated the nation and that surely was the best part. The worst part of this assignment is certainly putting out fires all the time which are stimulated by the media. A lot of stuff that we read from the media is totally untrue. There are a lot of mistruths out there which are stories that are generated by media outlets that actually have no idea what is going on. They don’t realize how that impacts our team and how that impacts on trust levels within our group. The putting out of fires and the constant work to make sure that the right message is out there I find incredibly draining. It takes away from my utmost focus and that is to make these players better. PakPassion.net: Do you think you have won over some of your harshest critics, such as Abdul Qadir? Mickey Arthur: I hope I have won over the critics and I do hope that people can see my passion about Pakistan cricket as well as for Pakistan. I am totally invested in this and I am not here for any ulterior motive other than to make Pakistan the best they can possibly be. In order to do that we have had to make some tough decisions. Those tough decisions upset a lot of people at times and we had to ruffle feathers to see some progression and in order to see a change in culture and in attitude. And I hope that the people can see that is what I am trying to achieve and everything I am trying to achieve is for the best of Pakistan cricket. I hope, I have won over more of the critics than first thought. PakPassion.net: What do you think of India’s chances of winning the 5-match Test series against England? Mickey Arthur: I think India will go quite well as they are a very good side. How they play in these conditions only time will tell. England are a very good side in these conditions as we saw them play against Pakistan when they had their backs to the wall. They came back and upped their game when it was needed. This will be a series which I will wait for in anticipation and watch very carefully. Last edited by Abdullah719; 19th June 2018 at 02:45. They should already extend his contract. Our best coach. Fell worry for haris and Babar haters as the coach rates them very highly also looks like selfie will be gone for good plus hockey player ie fawad is not rated by him at all and rightly so. He seems to be intrested to carry the job to coach pakistan again which is great news .pcb needs to extend his contract to 2020 before he change his mind or some other cricket board contact him. I am not going to lie but I was severely on the fence with a lot of stuff Micky was doing initially but I am now fully on board with the Micky - Sarfy - Inzi Trio and would like them to continue for at least another 5 years. Also, team culture and team direction are not established overnight. We need to invest however much we can over the coming 4-5 years and Micky seems the best possible choice to stick with (without any shadow of a doubt). Comitted, ambitious and extremely intelligent. I have absolutely no idea how PCB made this hire. One of the most committed coaches in world cricket at the moment. We are truly blessed to have him as head coach. Forget being Pakistan's best coach, Mickey Arthur is one of the premier coaches in world cricket. Proud to have backed the man from Day 1, even during the difficult times. A fantastic interview. We always set the top-order batsmen to get 300 runs or more. Our first six-wickets are responsible for 250-300 runs and the rest of the batsmen are supposed to get another 100 runs or so. By and large, our tail has delivered as well. I like how open Mickey is about strategy. He's right to put onus on the top five whilst demanding more from the tail. I hope he considers positioning Shadab Khan at #6 with Sarfraz at #7 though. Shadab has the technique to be a Test quality batting AR. Extend his contract man. He's doing a great job yet he still favours Rahat and Wahab which is concerning. I find his views Ahmed Shehzad interesting. I hope he does drop him. Fakhar and Babar opening in T20I is much better than Ahmed Shehzad opening. I said it even on the other interview thread too that he will not be extending his contract. He has really done a wonderful job for pak. He has backed the youngsters over oldies which is commendable. He is kohli's puppet. We need a real coach who can bring out the best in us. Its not just he is a pak team coach.. but I have never heard any coach talking so intelligently with so much precise planning. He is great to listen to.. Its not just pak team but he has a aim to prove himself to the world cricket which ridiculed him. He is so passionate and motivated amazing. Lol at all the praises that Arthur is receiving, wasn't he vilified for the test series defeat against Sri Lanka and the ODI series defeat vs NZ? Best coach in the world. This is what he means when he says we are passionate. The clinical manner in which an inexperienced and less-fancied Pakistan side dissected and then disposed of England in the first Test at Lord’s of the two-match series took most observers by surprise. Conventional wisdom had indicated that England, playing at home in early summer conditions, would prove to be untouchable for the visiting side which at the start of the tour had five players who had yet to make a Test debut. A 2-0 scoreline in favour of the hosts was, therefore, a given for many. Whilst the win for Pakistan at Lord’s by a margin of nine wickets would have instilled a lot of confidence in the young team, it also provided a unique opportunity to win their first Test series in England since 1996. But, what transpired at Leeds in the second Test put paid to all Pakistan hopes as a fired-up England side came roaring back to square the series with a comprehensive innings victory over the visitors. The victory at Lord’s may have left many hopeful about the incredible talent that Pakistan possess but the loss at Headingley was equally exasperating, especially for their head coach, Mickey Arthur, who threatened to unleash some venom on his team for letting go a rare opportunity for a Test series win in England. “After the Leeds defeat I had spoken about ‘Dishing out a hiding’ but that would have been taking it to the extreme,” says Arthur. “We are a young team, so inconsistency levels will be there as we forge our way forward. But, still for me and the team, we were absolutely gutted as this was an opportunity for us to win a series. Winning one Test against Ireland and another against England, after the amount of cynicism expressed by all and sundry at home and abroad regarding the capabilities of his team, could have been a satisfactory result for some but Arthur, the perfectionist, is having none of this. “People say that overall it was a good result and I agree it was a good result for sure, and if someone had said that coming on this tour we would win two out of three Test matches, we would have taken that gladly. The bowling attack was largely credited for Pakistan’s remarkable performance at Lord’s during the first Test. In that regard, Mohammad Amir’s resurgence as the leader of the pack was heartening in many aspects, but as he showed during the Test match against Ireland and at Leeds, there were ongoing concerns about his fitness which seemed to put a shadow over his future in Tests. This is an issue that Arthur and chief selector Inzamam-ul-Haq are taking very seriously, given the World Cup in 2019. “I am going to sit with Mohammad Amir and Inzamam-ul-Haq soon and we are going to map out a future for him. After our discussions, Inzamam will present the plan to the selection panel and then to the player,” said Arthur. To coach Pakistan is possibly one of the toughest jobs in world cricket. It may not be a scientifically proven fact but a quick look at the problems faced by Pakistan’s previous coaches, regardless of nationality, will show that coaching one of the most exciting and possibly most talented teams can easily prove to be a poisoned chalice. But, for a passionate technician like Arthur, coaching Pakistan is about facing all those challenges to build a world-beating side and then leaving a legacy of excellence. “This is a job I am very passionate about and one that I absolutely love. We have certainly changed the direction of thinking and put a lot of emphasis on areas that we need to improve upon. “One day when I am not Pakistan coach any more, I would like people to look back and say that we had a foreign coach and a coaching team that came with him and they have left a legacy for Pakistan cricket. Arthur’s reign as Pakistan’s head coach has seen a fair amount of lows and highs. The victory in the 2017 Champions Trophy tournament was a highlight but then there have been some embarrassing lows as well in the shape of heavy Test losses in Australia as well as the Test whitewash against Sri Lanka in the UAE. The Pakistan Cricket Board have put faith in his abilities to take Pakistan to the 2019 World Cup, but will Arthur look for a different challenge once the ICC tournament ends? It would appear that coaching a team like Pakistan which can produce match-winners like Hasan Ali, Shadab Khan and Fakhar Zaman with minimum fuss is something of an addiction for a trend-setter like Arthur. Whilst he may have faced criticism from some sources for his team’s performances that lack consistency, the drive to take Pakistan to the top is something that propels him forward. This love for Pakistan’s unique brand of cricket may also explain why when asked if he would accept, if offered, a chance by the PCB to extend his contract after next year’s World Cup, his reply is unequivocal. A lovely man who is very passionate about Pakistan cricket. Some pretend they care, but are only interested in money and making themselves look good, but Mickey is a man who genuinely wants the best for Pakistan cricket. He sets high standards and he expects players to maintain those high standards. He expects professionalism and will not accept people who do not give 100%. Good appointment by PCB. Sounds very genuine indeed. But but but he's wasn't a well known cricketer and idotis like qadir and co should have been appointed so we could have seen atgs like akmals and shehzads. The problem with Dav was that he was afraid to upset anyone and wanted to be friends with the players, coaches, PCB etc. However Mickey doesn't care if he upsets anyone because he believes in his methods and decisions. After this interview I said Mickey "you've not done too bad for a white man who hasn't played international cricket have you?" To which he laughed and said "there is still a lot of work to do." Good on you should have included this in the interview as well. Had enough of our shameless ex cricketers. I can promise you he loves his job and is doing a great job with passion unlike ours who only want the money and are not committed at all. You can see with Mickey he's emotionaly connected the same can't be said for our so called players who think they have a God given right to coach our team since they have played cricket. Well it was upto Saj to include that Q, but if that was part of interview, the reaction of Pak media would have been worth seeing, they wud have made a "bhatangand" out of it. Headlines like "Mickey disrespects Pak legend AQ"
When I do interviews I make a point of telling the interviewee when I have stopped recording and the interview is over. So it would have been unfair to include it in the interview text. Last edited by PakLFC; 24th June 2018 at 08:07. Decent interview. Disappointing response to the question about Fawad Alam. He says that they want to pick the best players but ignores the fact that Alam is the very best player. In any event, he is better than all of the current top 5 combined. His major blip was disastrous CT exit, but I would still discount that considering we still had great Imran Farhat, and the one and only Kamran Akmal playing in that era. Last edited by iniqbal223; 9th July 2018 at 02:56. Mickey has said he wants to leave a legacy for Pakistan cricket and he truly is a man of his word. What he has done to this team is nothing short of a miracle. I am not talking about results here, but rather the culture and identity he is developing for Pakistan’s cricket. He has created an environment where the players are allowed to succeed. They are given time and confidence. They aren’t afraid of being dropped after one failure. In turn this has allowed them to express themselves without fear of failure. Mickey has drilled into them how to be selfless and play for the team. They are humble and more interested in celebrating one another’s success than their own. The way they have gelled together is commendable. They are well led by Sarfaraz on the field, and Mickey off it. It’s clear they respect him and listen to what he says. The way every player has developed under his tenure speaks volumes. There are countless other reasons to praise him (player development, team strategy, identifying weaknesses in the team and addressing them, modernising the way Pakistan play LOIs to name but a few) but the culture and brand of cricket he is instilling in the team may well be his lasting legacy. Hats off to you Mickey! A brilliant post - Mickey reminds me of Bill Shankly and Alex Ferguson when they showed up at two mediocre, underachieving clubs. They revolutionised the fitness and training methods, and injected young blood. Like them, Mickey demands high standards. We see him betting with Shadab to make three 50s in ENG/IRE, and telling Fakhar to score 200 not 100 today. I hope his contract is until 2023 WC, not just 2019. Mickey has already made his legacy. He has brought Pak ODI batting into 21st century by debuting and backing players like fakhar, Asif etc. to play their natural games. Add to it non negotiable fitness standards and perform or perish policy to get rid of dead wood hangers on. Now all he needs to is continue development of youngsters like Shadab, Shaheen, Faheem and put in place good succession planning for Sarfaraz, Azhar and Asad trio. The fact that Pakistan was able to win Champions Trophy helped massively in the case of his stern discipline and standards. If God forbid, we had exited in the group stages of CT, there would have been a big uproar by the likes of Akmals and others pointing out how dropping them led to Pakistan's early exit and the shameless media mafia would certainly have backed his claim and given him a good backing, things could have been a lot different if not for CT. The victory gave a strong enough reason to the board and fans to trust Mickey's methods and standards. And since then, there has been some great overall progress in terms of fielding, bowling, batting and overall strength and depth of player's reserves. Inzi and co need to find at least 3 young batsman that then could work with Mickey. Micky has indeed created a legacy which not many have achieved prior to him. He is exactly the no-nonsense kind of coach that this young team needed. Hope this continues and takes us into a new era of greatness! I feel first time in many years, Pak is going in the right direction. Players are being picked based on merit. He needs to be given a contract till the 2023 WC. Submitted, eager and amazingly clever. I have positively no clue how PCB made this contract. A standout amongst the most dedicated mentors in world cricket right now. We are really honored to have him as head mentor. The Champions Trophy was a godsend but it wouldn't have happened without the culture shift CMA was already implementing. I think one of the reasons Shoaib Malik keeps his place in the side is because he was one of the first to step and take responsibility for his performance in the opening game blow out vs. India. CMA knew what he had in his team-he chose to back them and believe in them, and that makes much of the difference. After that win against SL I had a feeling they would start to come out and dominate as they'd already won two straight pressure games. It was a brilliant time tbh. I was so furious even before the start of the first game when I saw no Fakhar in the team, and Wahab Riaz being preferred over Junaid. Mickey took full responsibility of Wahab's selection something our previous coaches havent done. My point was, if we had failed to seal the chase against SL, would Mickey have been able to have the confidence of the higher ups in PCB and the media campaign would have surely started by Akmals for his ouster. If that hadnt happened, there might have been another formation of committee and the vicious circle that has happened so often in the past. Best coach in Pakistan cricket history. If Mickey doesn't participate in the pushups celebration after Pakistan wins the World Cup next year, then I will be very disappointed. He will, he cares a lot about the team, and works tremendously hard..
For sub continent teams, foreign coaches are always good. Local coaches bring bias with them. See whats happening with Shastri at helm. one of the best thing to happen to Pakistan this decade.